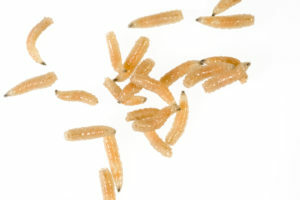 Fly strike is a dangerous condition where a fly lays its eggs on an animal and these turn into maggots which then feed on the animal. It can affect animals such as rabbits, guinea pigs, cats, dogs, and also farm animals. It is more common with dirty animals or animals that are unable to keep themselves clean, but even clean animals are at risk. It only takes one fly to lay its eggs for the problem to occur. This is a horrific problem to think about so it is important to understand the risks. As the fly is attracted by a soiled or broken skin, if you can prevent the attractant you will reduce the risk on your pet. It can occur at any time in the year, but there is a higher risk in warm weather. Older animals are a higher risk since they cannot clean themselves as well. Animals in hutches like rabbits are also high risk if they have stomach upsets and cannot clean themselves. This condition can be fatal and urgent veterinary care is needed to treat the condition. You can see the problem by smell, discolouration of the hair/skin, seeing the maggots on and in the skin, as well as sometimes hearing them. Your pet will try to rub the area against something, scratch or lick it, and you will see that they are unwell. You should always make sure your pet is clean; hutch animals should be checked twice a day at higher risk times as the condition can quickly establish and get worse. Some farm animals, especially sheep, can be treated with prevention treatments that reduce or eliminate the risk. Once treated, the condition usually clears up. However, the animal is at higher risk during treatment until fully recovered. Scarring or hair loss is common. The earlier the problem is identified and treated, the better the outcome.